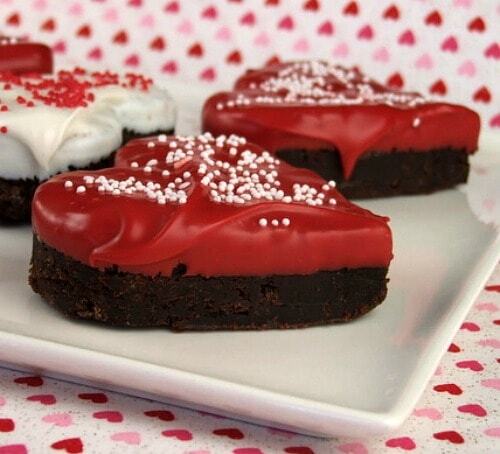 Chocolate- Dipped Brownies… for Your Valentine! Warning! This post has absolutely nothing to do with healthy and low fat eating. It is Valentine’s week, however, and I’m one of those people who volunteered to make treats for teachers, classroom, etc. Call it torture during my time of healthy blogging, but I believe in living life as usual and just making good choices. The baking must go on! 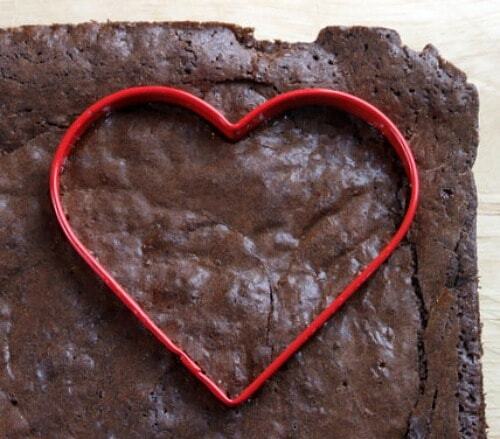 This one is for the teachers… and a few for the hair salon too: Chocolate- Dipped Heart Brownies. Prepare the brownies as directed… leave out the oreos. I wouldn’t try to put this one in a 9×13 pan- the brownies will be too thick. If you don’t have a 1/2-sheet pan, you could try a 9×13 and an 8×8. A 2-inch heart-shaped cutter is perfect for this project. 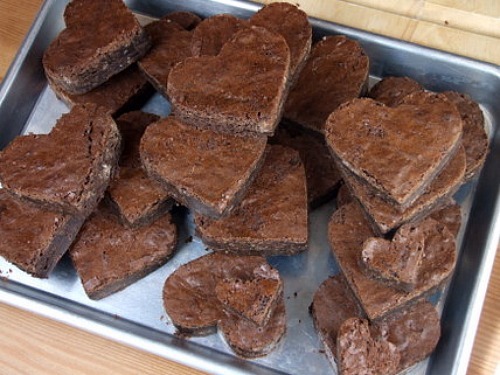 Place the whole slab of brownies on a large cutting board and start cutting out hearts. Make sure the baked brownies are chilled- just gently push down and then lift up the brownie slab and pull the cutter away. 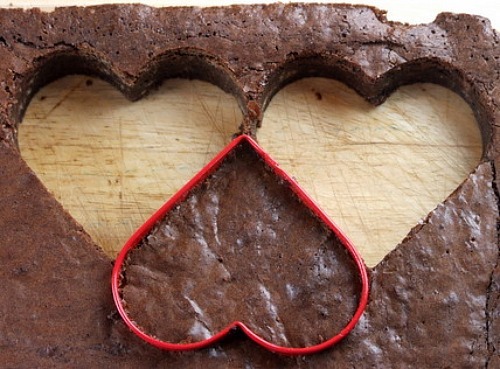 Carefully push out the heart-shaped brownie and remove to a tray. 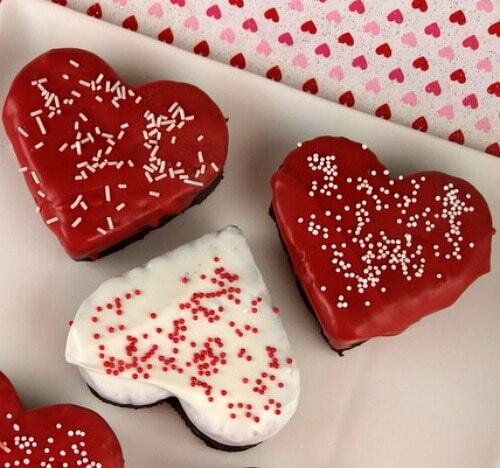 If you cut the next row of hearts upside-down, you’ll get more hearts out of the batch. If you use a 2-inch cutter, you should be able to get 24 brownies out of the batch. I also punched out 3 tiny hearts with my smaller cutter. (The brownies should be chilled for this part too). Melt desired chocolate in a bowl (in the microwave) and stir until smooth. I used red & white A-Peels for my chocolate, but you can use any. Brush crumbs off of the top of the brownie and hold onto the sides toward the bottom. Dunk the tops into the melted chocolate and place on waxed paper to dry (chocolate-side-up). Sprinkle festive decor on top, if desired. I thought they turned out quite pretty. I don’t think this would work with just any brownie recipe. Use this one for fudgy, sturdy brownies. I managed to get through this recipe without sampling a single brownie (applause, please!) The scraps were placed into little zips and thrown in the freezer for school lunches. What are the dimensions of the sheet pan that you used? They are in the recipe. There is a link to the brownie recipe that I used within the post. 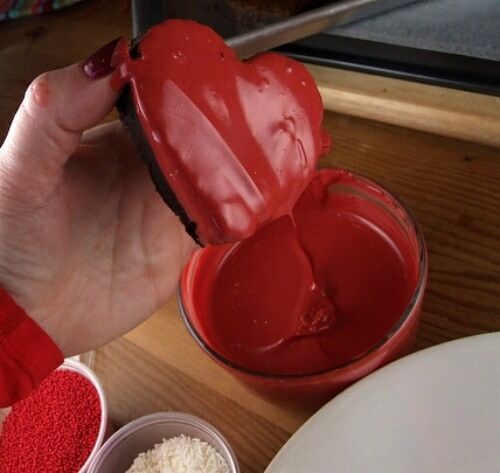 I would love to make these..How did you get the chocolate dipping to be red and white? I used red and white chocolate wafer disks from Wilton- you’ll find them at Michael’s or a baking supply store. I made these brownies they turned out delicious. I did not use the the red dip I used white frosting on them with red sprinkles. yyyuuuummmmyy! oh.My.GOODNESS! What a great idea. Thanks! 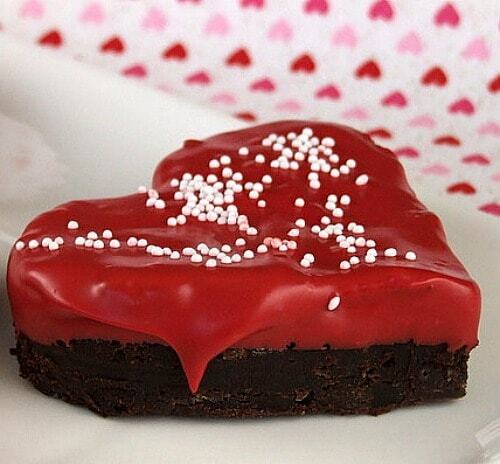 Brownies are awesome! and these are way to cute!